We love the new layout and the open space feels fresh but the experience and merchandising still feels largely traditional. While the Saks beauty floor has moved up a level to the second floor and undergone extensive renovations, much of the product remains familiar. You can still come to Saks to find your beauty staples from brands like Lancome, Clinique or La Mer. You can also find some international beauty products like fragrance from French brand Ex Nihilo that are exclusive in the US to Saks. What you won’t find are some of the up and coming beauty brands like Milk Makeup or FENTY BEAUTY by Rihanna that you can get from Sephora. The main change from the renovation is the higher emphasis placed on wellness and services. as evidence by the mini-boutiques from British facial workout brand Face Gym and Skinney Med, a non-invasive cellulite and fat removal company. The Saks beauty floor isn’t necessarily going to bring back customers that have left for places like Sephora or The Detox Market, but the new emphasis on services should encourage existing customers to spend more while they are there. The people at Saks are exactly what you expect from a high end department store. They cater to the typical Saks customer in the way they always have. They are professional, helpful and knowledgeable. From personal experience, this traditional approach can feel a bit off-putting to millennials who are used to interacting in a different way. This is especially glaring when the sales associates try to upsell you from spending $15 on mascara to $100 just to get the free tote bag (don’t worry, we didn’t bite). 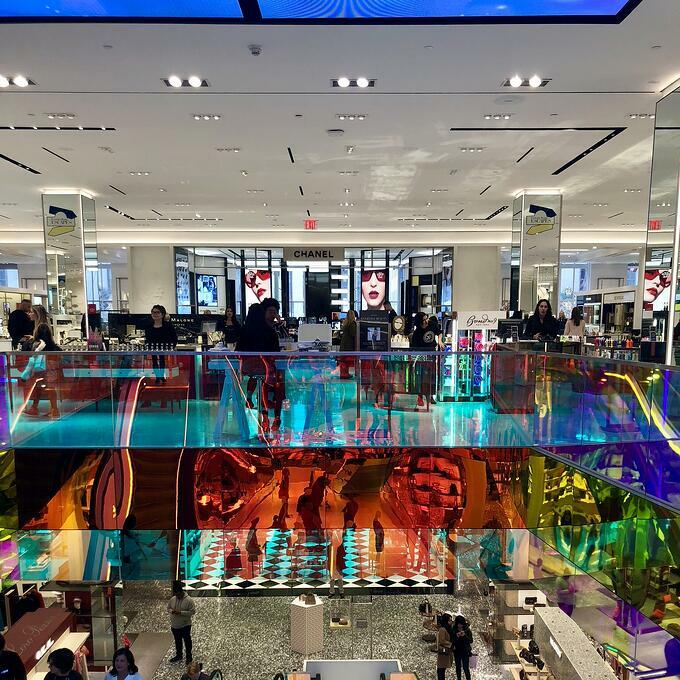 Saks made big news by changing up the typical order of the floors and moving beauty to the second floor and putting in an atrium on the first floor. While the neon escalators have raised some eyebrows (is it tacky? cool? modern? that remains up for debate), the overall effect of the atrium is positive. It opens up the space, allows in more natural light and makes the overall experience feel less like a staid department store. We like the boutiques that line the perimeter of the beauty floor itself but felt overwhelmed by the promotional signs that were heavily interspersed throughout the store. Many digital native brands have made their name by discouraging promotion and relying on “transparent” pricing to woo customers. As millennials, the promotional focus on the Saks beauty floor felt like a throwback to an older retail era. While Saks has done a good job bringing in new brands like Face Gym and opening up the physical space, the overall vibe still feels a bit traditional.